The biceps muscle is made up of 2 parts: the long head and the short head. The long head of the biceps is most commonly implicated with tendinitis, as the tendon from the muscle runs up the length of the arm and attaches into the shoulder joint. It becomes a part of the shoulder joint capsule, which is surrounded by numerous other structures, including the rotator cuff. 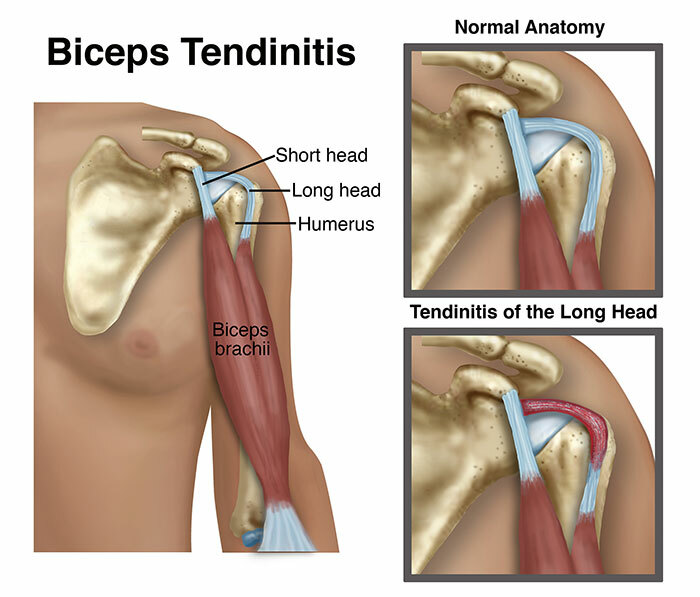 Biceps tendinitis result when excessive, abnormal forces are applied across the tendon, including tension (a pulling of the muscle and tendon), compression (pushing or pinching), or shearing (rubbing). When the tendon is subjected to repetitive stresses, it can become irritated, swollen, and painful. When you first go to see your physical therapist, the therapist will review your medical history, ask you to describe your shoulder condition, and then perform a comprehensive physical exam of your shoulder. Your therapist will assess different measures, such as sensation, motion, strength, and flexibility, and may ask you to briefly perform the activities that cause your pain. Your physical therapist will likely touch various areas on your shoulder to see which seem to be most consistently painful. Other nearby areas, such as your neck and upper back, will also be examined to determine whether they might be contributing to your shoulder pain. Imaging techniques, such as x-ray or MRI, are typically not needed to diagnose biceps tendinitis. However, in the event that your physical therapist suspects there are other conditions present in your shoulder, you may be referred to an orthopedist for further investigation. Range of Motion. Often, abnormal motion of the shoulder joint can lead to biceps tendinitis. Your physical therapist will assess your shoulder motion compared to the expected normal motion and to the motion of your other shoulder. Strength. The muscles of the shoulder and upper back work together to allow for normal, coordinated upper-body motion. Based on the way the shoulder joint is designed (a ball-and-socket joint, like a golf ball on a golf tee), there are many directions in which the shoulder may move. Therefore, balanced strength of all the upper-body muscles is crucial to make sure the shoulder joint is protected and is moving efficiently. There are many exercises that can be done to strengthen the muscles around the shoulder so that each muscle is able to properly perform its job, and stresses are appropriately dispersed. Manual therapy. Physical therapists are trained in manual (hands-on) therapy. Your physical therapist will gently move and mobilize your shoulder joint and surrounding muscles as needed to improve their motion, flexibility, and strength. These techniques can target areas that are difficult to treat on your own. Pain Management. Your physical therapist may recommend therapeutic modalities, such as ice and heat, to aid in pain management. Functional training. Whether you work in a factory, are a mother of a young child, or play baseball, the ways in which you perform your normal daily activities can affect the health of your muscles, tendons, and joints. Improper movements can, over time, cause pain in the body. Physical therapists are trained to be experts in assessing movement quality, and in training people to function at their best. Your physical therapist will be able to point out and correct faulty movements, so you are able to attain and maintain a pain-free shoulder. Often, the strategies learned through specific education from your physical therapist will allow you to avoid reversing the positive effects of your physical therapy treatment during your normal daily activities, and help make sure your improvements last. Avoid repetitive overhead activities that cause shoulder pain. If you must move this way for your job or sport, make sure you set aside time to properly rest your shoulder, to avoid overworking it. Check your posture. The shoulder, neck, and back are all at risk of injury when they are held in a poor posture over a long period of time. Ask your physical therapist to discuss your work environment; describe how you move (or don't move) throughout the day. Avoid lifting or carrying heavy objects held away from your body. Keep items close to the body and, when possible, use both hands and arms. Perform rotator-cuff strengthening exercises regularly. Consult with a physical therapist if your symptoms are worsening despite rest. Doug is a 45-year-old man who works as his town's lone electrician. He is also the father of 2 children, a 10-year-old son and a newborn daughter. With the addition of the new baby, his wife has decided to take extra time off from work, so Doug has been working extra hours. Over the last month, he has felt pain in his right shoulder when making certain movements. He is still able to work, but not without a lot of discomfort, especially after working long days. He has also started waking up in the middle of the night after having rolled onto his right shoulder, and this is starting to cause disruptions to his wife's sleep—the little that she gets. Doug doesn't remember ever hurting his shoulder; it just seems like the pain came out of nowhere. One of Doug's friends mentions that he had a similar issue with his shoulder and went to see a physical therapist. At the encouragement of his tired wife, Doug decides to give it a try. Doug’s physical therapist asks him questions about his activity, work, and prior shoulder conditions. Doug mentions that in addition to putting in extra hours at work, he has also just started coaching his son's Little League team and has been doing a lot of throwing with the boys at practice. Doug's physical therapist conducts a thorough assessment. She compares the motion and strength of each shoulder, and conducts tests to help determine the source of Doug's pain. She explains that his rapid increase in activity (work and baseball), specifically doing tasks that place his arm overhead for sustained or repetitive motions, has led to his developing biceps tendinitis. Over the next 4 weeks, Doug works with his physical therapist 2 times a week to decrease his shoulder pain. She uses manual therapy techniques to improve the mobility of his shoulder joint, and prescribes a progressive exercise program to strengthen the muscles of his shoulder and upper back. She adapts the program to meet Doug’s crazy schedule. She even suggests that he make the exercises a fun father-son time! Within 6 weeks, Doug is amazed by his progress. His shoulder pain has diminished, and he feels stronger and can work longer without developing aches and pains. And best of all, he can rock his baby girl and toss a ball with his son in the backyard as much as he likes! When you contact a physical therapy clinic for an appointment, ask about the physical therapists' experience in helping people with shoulder pain. The following articles provide some of the best scientific evidence related to physical therapy treatment of arthritis. The articles report recent research and give an overview of the standards of practice both in the United States and internationally. The article titles are linked either to a PubMed* abstract of the article or to free full text, so that you can read it or print out a copy to bring with you to your health care provider. Timmons MK, Thigpen CA, Seitz AL, et al. Scapular kinematics and subacromial-impingement syndrome: a meta-analysis. J Sport Rehabil. 2012;21(4):354–370. Article Summary on PubMed. Longo UG, Loppini M, Marineo G, et al. Tendinopathy of the tendon of the long head of the biceps. Sports Med Arthrosc. 2011;19(4):321–322. Article Summary on PubMed. Nho SJ, Strauss EJ, Lenart BA, et al. Long head of the biceps tendinopathy: diagnosis and management. J Am Acad Orthop Surg. 2010;18(11):645–656. Article Summary on PubMed. Thigpen CA, Padua DA, Michener LA, et al. Head and shoulder posture affect scapular mechanics and muscle activity in overhead tasks. J Electromyogr Kinesiol. 2010;20(4):701–709. Article Summary on PubMed. Senbursa G, Baltaci G, Atay A. Comparison of conservative treatment with and without manual physical therapy for patients with shoulder impingement syndrome: a prospective, randomized clinical trial. Knee Surg Sports Traumatol Arthrosc. 2007;15(7):915–921. Article Summary on PubMed.